This little kitchen coffee caddy is really great. I used to have to pull out my coffee maker and it was not smooth or easy to maneuver to pull close to me on the counter and then back again. But now that I bought this little device it just glides and slides back and forth so wonderfully. VERY USEFUL and glad I ordered it!! 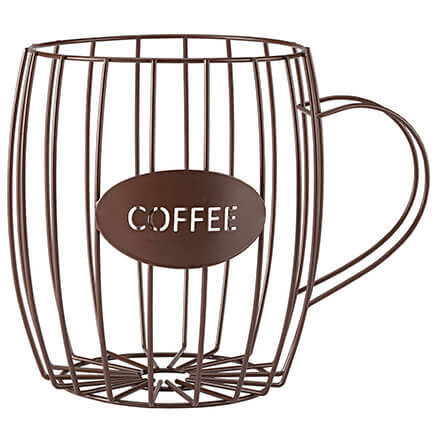 Well worth great for coffeemaker! Under coffee maker works great ,no longer have to pull coffee maker out and push back and forth. everyone should have one in there kitchen. It works great in my kitchen not just for coffee maker but great for blender, toater and anything you need to move but don't want to move the whole thing . I had these handy caddys under my coffee machine and blender. They are so perfect and have made my kitchen so much easier. No more pulling my appliances in and out on the counter. Highly recommend. I don't have much counter space & what I do has cabinets above it making it difficult to make coffee. This has solved this issue perfectly it makes the coffee pot glide in & out from under the cabinet. Wish I had bought one sooner. I loved mine so good, I ordered one for my friend as a gift. She will love hers too. Very handy item. love this, looked hard to find one! i love that it gives me more counter space! I use it to put my Keurig coffee maker on. It works great and saves counter space. I have bought 2 for myself and my 3 kids I have bought for friends?? I have one, have purchased one for our son and this was was purchased for our daughter and son-in-law. We all love this product. 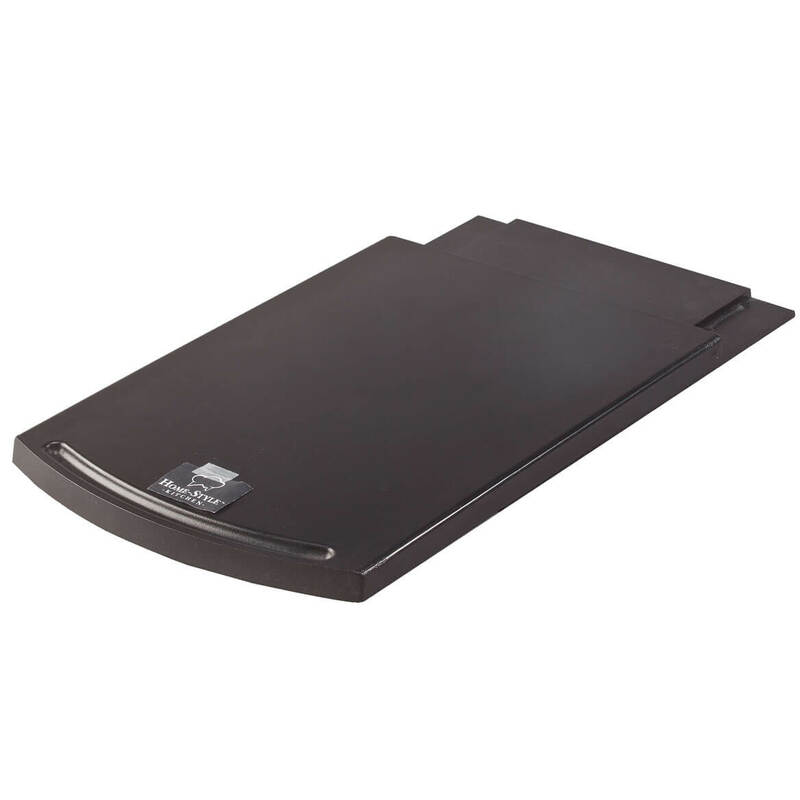 I use it for the coffemaker, and it does a great job keeping the appliance out of the way when not in use. I have recommended it to two of my friends who also got one. I use it for my electric water pot, I just slide it forward to fill it with water. Need another one for my blender. The color is black, would like to see it also in white or a cream color. I have been lifting a coffee maker from under the cabinet, using it, then lifting it to put it back under the cabinet since we bought this home. It's a small thing, but it bothers me just a little bit every morning, and I am irritable enough in the morning before my coffee anyway. This clever gadget works great and is the solution to this NUT! Well, Dr. Oz calls them NUTs as in Nagging Unfinished Tasks and he claims NUTs age you if you don't do something about them. One NUT down, now on to the wobbly toilet seat. Terrific idea and so useful! Every morning I drag the rather heavy single cup coffee maker from the back of the counter under the cabinets to the front---and lift it awkwardly to the back of the counter when I'm through. It's a PAIN! 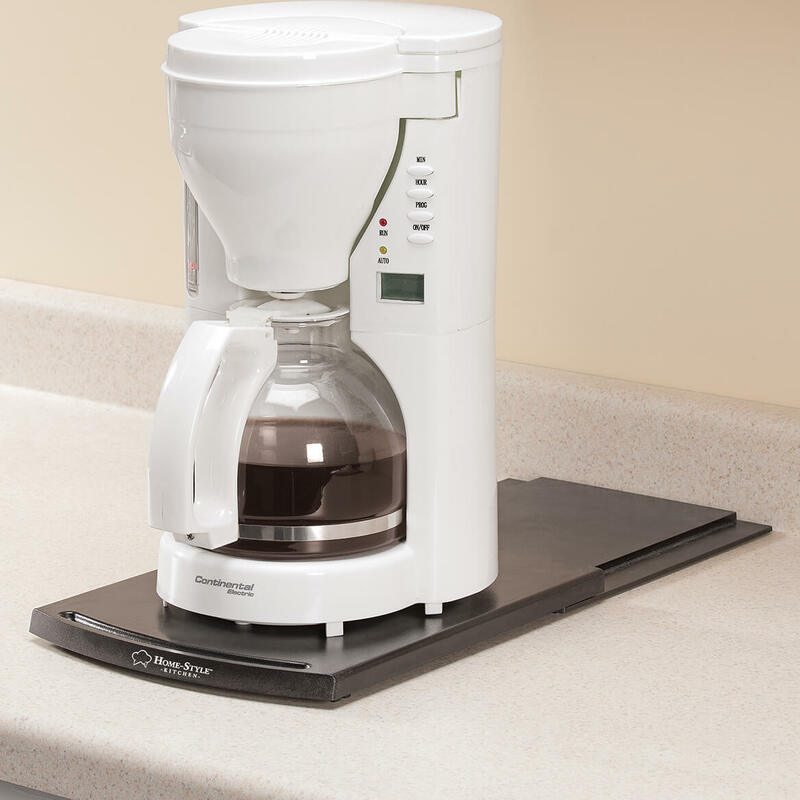 This product takes up very little space, allows me to keep the coffee maker where I want it, SLIDE it right in front of me when it's coffee time and SLIDE it back when I'm through! Protective "feet" prevent scratching and the slide mechanism works perfectly. This would make a great gift. My counter is deep and I always pick up the coffee pot and bring it to the front of the counter then back in the morning and then have to move it to make coffee and move it again. Well, this slider is super. Now the coffee pot pulls right to me and when I am finished, I can push it all the way back. Very compact little item. Great. Bought for my coffee maker. Very useful and convenient. Handy caddy does exactly as it is intended to do. Have used it daily for a few weeks now and am happy I got it.Have my coffeemaker on it makes it easier to bring it forward from out of reach. Worth getting. I use it under my coffee maker because my cabinet is very low and I need to move the maker out to put water into it. So easy to use. Bought one for under my toaster, too! I have not found any cons. I love it. Bought one for my daughter she also love it. Bought one, love it. Bought a second one for the Summer place! This is just what I wanted to use under my new coffee maker. 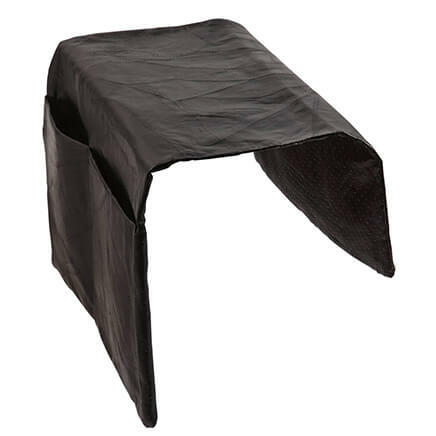 The product is made of black plastic and well balanced. No adjustments needed. There is a groove in the front making it easy grab. I was surprised how far it rolls out from under the counter with a bit of room to spare. Works great for the coffee maker, should be equally good for any appliances. I would buy this product again. I love it. I placed it under my Keurig coffee maker which is under my cabinets makes it so much easier to get to it. Very easy to use and slides well on the counter for easy access to coffee pot. This is great. I use it under my Kitchen Aid mixer that I keep on my counter top. It is strong enough to support it. When I want to use my mixer, all I have to do is slide it out. This thing works fantastic. I slides in and out and I am very pleased. When I am not using my coffee maker, I just push it to the back of the counter out of the way. HOLY MOLY ....... WORKS LIKE A CHARM ! The last thing I wanted after spending a good deal remodeling the kitchen, was to have all my new counter space taken up with appliances. So I can ready my coffee, then push it out of the way under the cabinets. I love this caddy. It is indeed handy. I wish I'd ordered this years ago,! I store my Cuisinart coffee pot on the counter under the cabinets and don't want to brew the coffee under the cabinets because the steam could damage them. This slide makes moving it out a snap! I also set up the next day's coffee before sliding it back under the cabinets. I've bought one for lay daughter and one for my son! a pretty neat item saves counter space. I have a coffee maker on the counter, tucked under the cabinets above. Each morning I'd pull it forward to pour the water in and then push it back to out of the way. To avoid repeated wear on the counter I would kind of lift it up to move it forward and back. And this is a Bunn coffee maker so it's always full of water and a bit cumbersome to move. It was annoying. 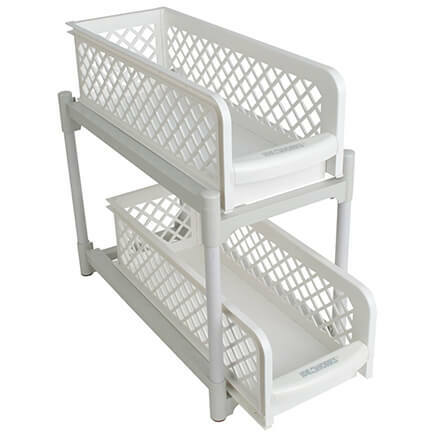 I'd decided to build my own sliding base, when I came across this handy kitchen caddy. I does exactly what I wanted, for under ten bucks. The construction and appearance are on the cheap side (which is why I knocked off a star) but the price reflects that, and anyway it does the job. Use them for bringing small appliances into range for easy use and then move out of the way when finished. Nice product, but there are not instructions, so one is left on their own to figure out how to set it up. This works great to keep my coffee maker out of the way until I need it. It rolls in and out very smoothly. My only complaint is that I wish it had a stop so it would not roll off of the tracks at the end; I will probably figure out a way to do this though. Still a great product. Not heavy duty enough for a bowl lift mixer. I bought this because reviewers wrote that it worked on their Kitchenaid mixers. They must have tilt head styles. My Kitchenaid bowl lift is a brute. The caddy kept running it off it's trolly. I'm sure it's OK for less heavy appliances. I love mine so I thought my sister-in-law could use one too! I already have one and love it! Needed more for other appliances. I had one of these before and loved it! Have one in the house. This one is for the camper. Using it without the base tray.. Only the tray with rollers. Love it. I have a small kitchen. Cabinets above the counter. Slides out, so i do not have to move the coffeepot back and forth. Will save my counter top from further coffee stains. I have one for one of my coffee makers, and I have another, so I needed another one. These are fantastic. I did a coffee station in my kitchen, and wanted this to make my coffee maker more accessible. So I can slide the coffee pot back when done and have more counter space. It is so handy. Just pull out coffee pot and make coffee and slide it back under cabinets. Love it. Ordered one for my two daughters and granddaughter. They love them too. Now i'm ordering one for my ex-husband. Caddy gives me better access to brew my coffee. Excellent purchase! To see if our Bunn coffee maker will fit on it. My counter is getting scratched by moving the coffee maker back and forth. My aunt has one and loves it. I have limited counter space and am constantly dragging my coffee maker out and pushing back. This should solve the problem. Every day when I make my protein shake I move the blender from the back of the counter to the front for better access...then back again....thought this would make it easier. I get tired of having to pick my coffee maker up every morning to set it up and then have to pick it up to move it back under the counter. Perfect i am disabled, this would allow me the access my coffee maker. I have one already, and I need two more for my Mixer and Coffee pot. I love it, and I have looked all over for another one. 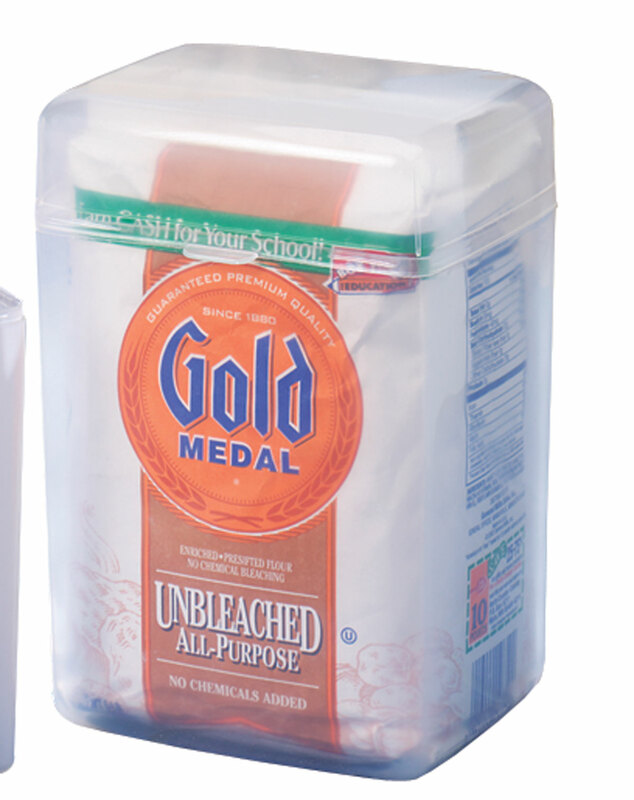 I HAVE ONE OF THESE BUT I HAVE SPILLED WATER ON IT AND NOW THERE IS WHITE STAIN ALL OVER IT. THE NEW COFFEE POT I GOT IS VERY EASY TO FILL AND I DON'T SPILL WATER ON IT, MY WATER IS VERY HARD. rust marks were showing on some of my dishes - I tried these and they covered the problem and no more rust on the dishes. this is the 2nd batch that I have purchased. love them. Has worked wonderful for my coffee pot, that sits under my cabinet. this saves valuable counter space its awesome. I have one in our condo at Destin....love it. Now I want one at home and ordered a spare. This is for my husband who pulls the coffeemaker away from the cupboards....the steam takes away the wood finish! What is the length of this? You have given 2 "wide" measurements (8 1/2" and 21") and 1 height measurement (1") but no length. BEST ANSWER: Thank you for your question. It opens to 21" long. We hope this information will be of help to you. What is the LENGTH and WIDTH? I need both measurements. Is the "8 1/2" wide actually the length that then stretches out to 21" long? If so then what is the width? BEST ANSWER: Thank you for your question. More information is listed below for this item. We hope this is helpful. •Whole caddy when together is 1” high. Is the handy caddy strong enough to support a 13 cup food processor or a vitamix blender? BEST ANSWER: Thank you for your question. Yes, it is strong enough. We hope this information will be of help to you. Picture shows caddy on counter. Do not understand if this goes under countertop inside of bottom cabinet or ontop of counter??? BEST ANSWER: This product is designed to allow coffee made to sit on counter and slide from under upper cabinet to easily fill water. I should think if you have enough cabinet height it could be used for ease of access. I gave it to both our sons (they have Keurig coffee makers with limited cabinet and counter space) and it works well for them. This is meant to sit on TOP of the counter, underneath the upper cabinet. It allows you to keep the coffee maker (or whatever appliance) under the upper cabinet and then slide it out easily to make a new pot of coffee. After the coffee is made, it can slide back. It's not fancy, but I find it very handy. I placed my caddy on the counter top below the upper cabinets so that I can easily pull it forward the put the water and coffee in it . I think if you place it inside of the bottom cabinet and pulled it out it would flip over, unless it is secured to the shelf in the cabinet. You put the caddy on the top of the counter and the coffee pot on top of the caddy and then when you want to make coffee extend the caddy. I really like my caddy as it keeps the steam away from the cabinets but slides away when not in use. Hi...it goes on top of counter top. You put your i.e. Coffee maker on top of it. When you use the coffee pot , pull it out. It slides back and forth instead of moving the entire coffee pot physically. I love mine. On top and I love it so the coffee pot doesn't make the counter too warm. I am going to buy another one soon. I also love how it slides forward and then back so it doesn't jut out!! It goes on top of the counter. It allows you to slide the coffeemaker towards you easily. I like it because it makes it easier to fill the coffee pot with water. It fits on countertop but back under top cabinets and then slides out to fill coffee pot. 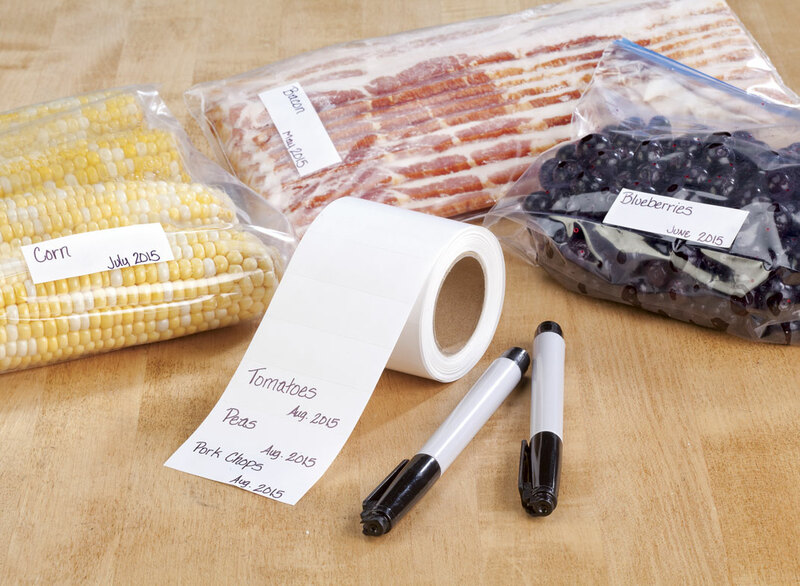 Easy to slide back and forth for easy filling.. We love it! It goes on your counter and enables you to pull it out to fill top of coffe pot with water and then you slide it back under the cabinet. Works great. This unit is like a tray and sits on top of the counter. When not in use it pushes back and out of the way, using about half the amount of space. I keep my coffeemaker on counter under my kitchen cabinets and its so helpful to pull out coffeemaker to put water in and ground coffee. I use mine on top of my countertop,and I place my coffee maker on top of the caddy.I am really enjoying using this item. 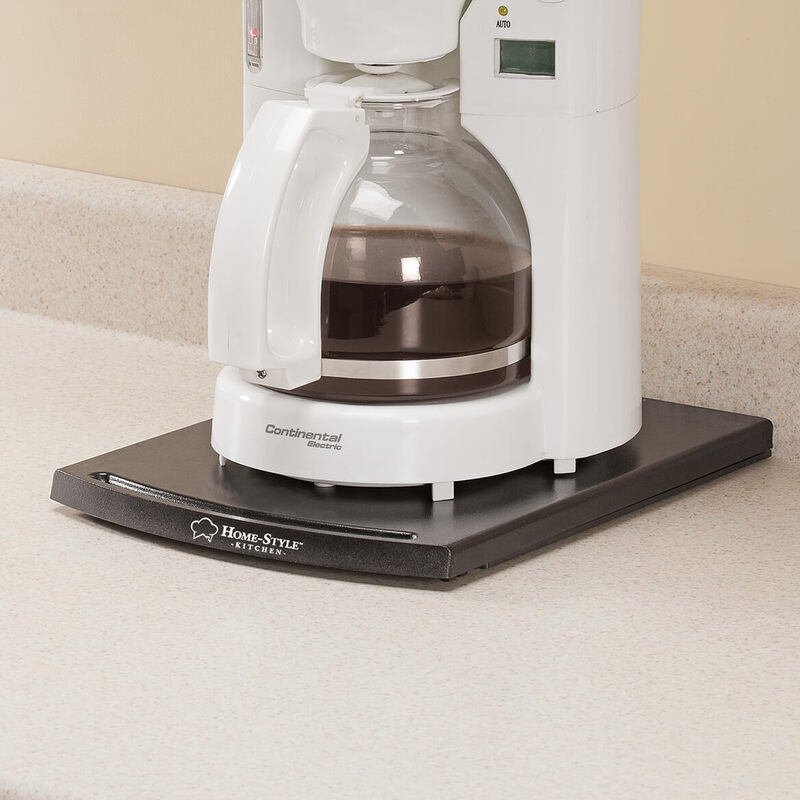 The caddy goes on the counter under the coffee pot so it can be pulled forward to use & pushed back when not in use. The caddy sits on top of the counter and you then place the coffee maker on top of it and slide it out as needed. I use mine on top of the counter. It makes it easy to slid my keurig without scratching my countertop. It goes on top of the counter. On top of the counter. What does it take and how hard is it to assemble this? BEST ANSWER: Very simple, just slides together. It will slide off if you pull your coffee maker way out though. I do like it because it slides easily & I feel it is helping to not mark my countertop. couldn't be any easier really just slides together. Not hard at all and its very convenient. very easy, fits Kuerig great. is this safe enough to put a toaster on it and use the toaster? BEST ANSWER: Yes I think it would be fine to put and use a toaster on it. The toaster is light so it will slide back and forth easily I like it and use it everyday, keeps things in order and just pull it forward when you need it very easy. Thank you Donna! I believe i'm going to get 2 of these. my coffee maker and toaster both set on the same counter and will help to keep it looking neat and clutter free. thanks for getting back to me so quickly. I would hesitate because my toaster gets hotter with more direct heat than my coffeemaker. This sounds to me like a questions for the manufacturer. I use it for my morning coffee. works great. What is the measurement of the area that the appliance actually sits on? BEST ANSWER: Your use of length and width are quite confusing. If it is 8 1/2" wide and sits 1" high on the counter, it probably opens to a DEPTH of 21" - that is from the back to the front of the countertop. Seems like this confusion pops up somewhere in just about every catalog these days. Thank you for your question. The measurements for this item are 8 1/2" wide x 1" high; opens to 21" wide. We hope this information will be of help to you. No, I need to know how big it is UNOPENED, as my coffee maker sits on the top part only. I need to make sure it is big enough. 8 1/2"wide x ?? before you slide it open. Will a Bunn coffeemaker fit on this? BEST ANSWER: Thank you for your question. That depends on the size of the the coffee maker the caddy is 11"L x 8 3/4"W. We hope this information will be of help to you. What is the length of the base that the appliance sets on? BEST ANSWER: Thank you for your question. The length of the base can stretch out to 21". We believe it should hold any standard mixers. We hope this information will be of help to you.